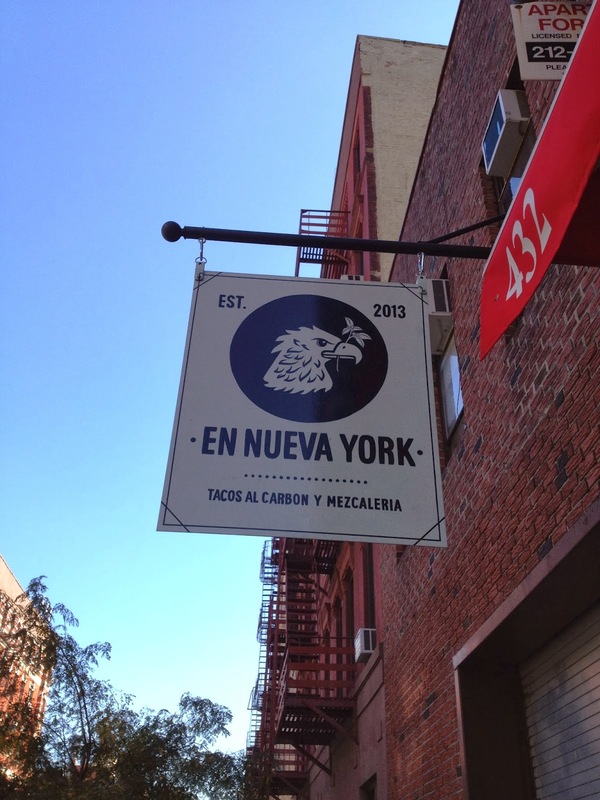 The days of lamenting the astonishing lack of good Mexican food in NYC are over. It was always a curious thing that in this, the great city of immigrants, where you could get every different type of ethnic food imaginable, there was a total dearth of good Mexican food. That has changed, quickly and dramatically. You have natives of Mexico like Roberto Santibanez of Fonda and Salvation Taco showcasing all the diversity and depth of Mexican cuisine and non-natives like Alex Stupak of Empillion combining a passion for the cuisine with an open-ended curiosity to push the food into new realms. At this moment we are in the midst of a Taqueria explosion. They are popping up everywhere, nowhere more so than in the East Village. It is hard to keep up with them but it is fun to try. I recently tried the latest from one of the chefs that has raised the level of NYC's Mexican food scene, Sembrado. 13th Street between 1st Avenue and Avenue A is a very nondescript block. It is dominated by the back of the local post office and its delivery dock. There has been little reason to walk this block unless you lived on it. Now there are tacos. 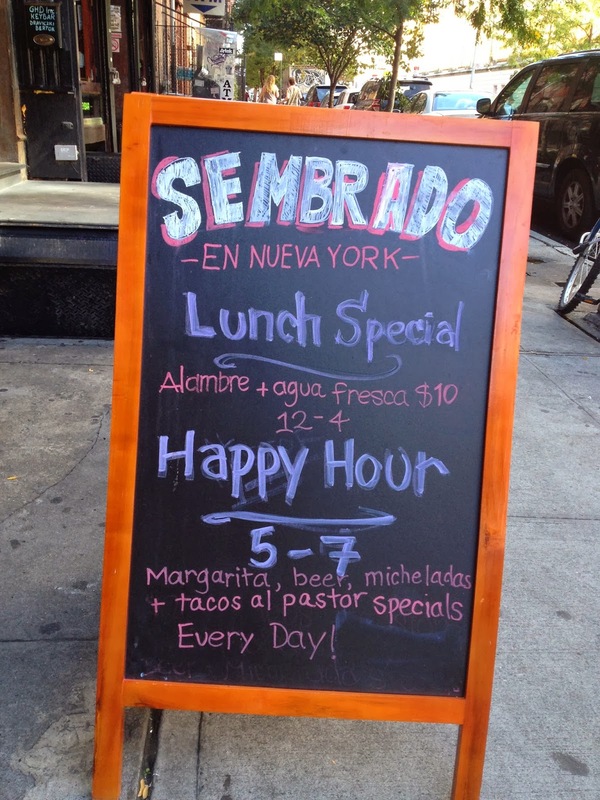 Sembrado is the newest restaurant from Danny Mena, the chef of Hecho en Dumbo on Bowery. Sembrado's menu is focused on Tacos Al Carbon, a special style of grilled meats in Mexico City. 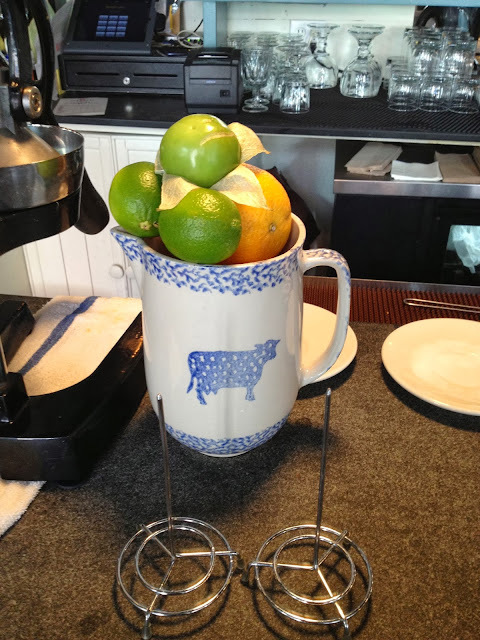 Sembrado also has a full bar with a focus on Tequilas and Mezcals. 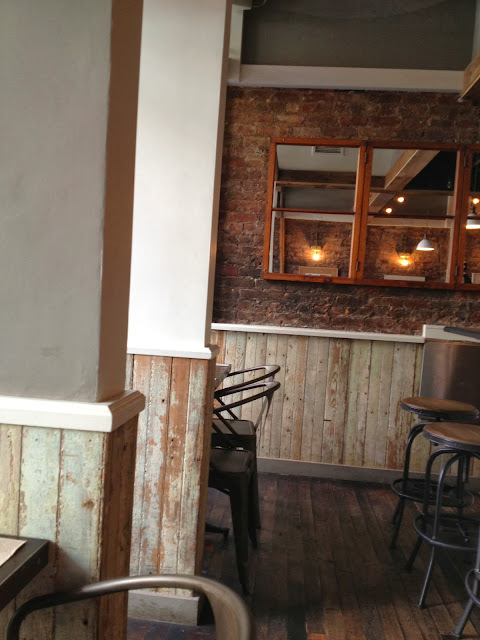 Sembrado is a small space that has been beautifully built out. Exposed brick walls are framed in wood painted white. Art and touches of Mexican tile bring plashes of warmth and color. Large windows look out onto the street, letting light in. On warm days the windows are thrown open giving the space a bigger feel. The menu is simple and straight forward. Tacos (authentic, small tacos, not the big hand held Taco Bell kind) are the main focus but the menu also features Alambres (Mexican stir fry) and Costras (caramelized cheese on flour tortillas and meat) along with a few sides and starters. Tacos Al Pastor is the house pride along with the various Tacos Al Carbon. I tried Sembrado at lunch. 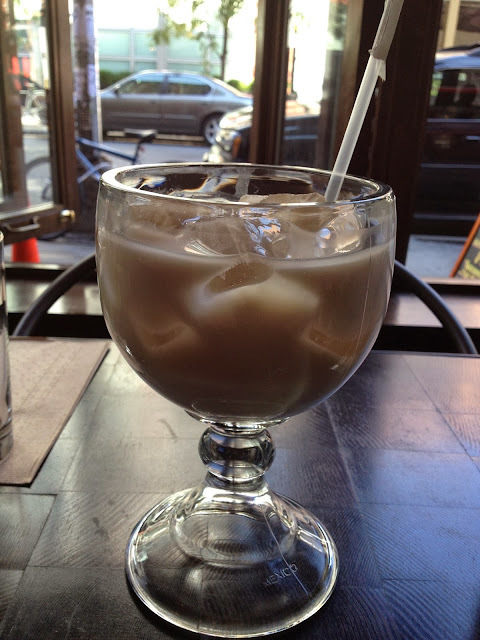 As much as I wanted to sample one of the house cocktails I opted for the Horchata. It was delicious and refreshing. Despite the temptation of the daily Alambres lunch special I had to go with tacos. I ordered three to start. Al Pastor (marinated pork), Bistec (Flatiron steak) and Hongos (Portobello mushroom) with cheese. Sembrado makes their own hot sauces and condiments for the tacos. Two hot sauces, one green and one red, along with a smoky poblano sauce and pickled onions and hot peppers. They are fresh, delicious and pack a punch. When you decide to have a narrow focus on a particular style of food or item you had better deliver the goods. Sembrado does. The tacos are outstanding. The Al Pastor was juicy and rich from the marinade. The Bistec was simple with the quality of the meat coming through. The Hongos was meaty and funky in the best way grilled Portobellos can be. A touch of Mexico City in New York City. I ordered another Al Pastor. Sembrado is another welcome addition to the growing number of excellent Mexican restaurants in New York and another step forward in showcasing the diversity of the cuisine. Sembrado is perfect for a solo meal or a group dinner. It is great for a quick snack and drink or a leisurely meal. When you are in the mood for tacos, Sembrado fits the bill. Mexican dishes are definite must try! They offer authentic Mexican dish that will make our palates happy. I have a Mexican friend who used to go at http://www.education.com/question/put-word-essay-writing-advice/ and makes delicious nacho dips and quesadilla. Oh, I was there! Think it was 2 or three years ago. This place have such a lovely design. However, food was very mediocre and it was disappointing. In addition, they didn’t have any good sweet drink!!! It’s essential for me to have a delicious sweet drink in a places like that. That’s all because I’m not drinking alcohol and coffee and it’s very difficult to me in place that don’t have any of drinks of my taste. If only bars had websites with reviews like essay has. Something like review of Essaydune.com could be very helpful to me. You'll get around an hour of shaving from a solitary fee. www.simplesite.com close-cropped hair on your scalp also. 9 best beard trimmers to acquire yourself an electric beard cutting machine. best trimmers The steel blades hone themselves as you trim What’s the Best Beard Trimmer? An additional razor from Panasonic is look here around the nose and also the sideburns.